Very few high-end tuners receive nothing but rave reviews among their users. Even the top Sansui, Kenwood, and Accuphase tuners, and the priciest Magnum Dynalabs and Sequerras, have their detractors as well as fans. Generally, however, a consensus emerges. It seems to us that the Sumo Charlie produces the most polarized opinions of any tuner -- in other words, its users either "love it or hate it." Among TIC panelists, there is far more criticism than praise, and several of our contributors have chimed in with rather colorful negative commentary. Yet, there is a small group of Charlie enthusiasts, led by its late designer, James Bongiorno, who believe[d] it is a top tuner. We thought we'd put up this page to provide a forum for this unusual debate. An even more unusual debate is ongoing regarding the marketing (or not) and even the existence of a tuner called "Charlie" that was manufactured (or not) by Great American Sound (GAS), a company founded by Bongiorno before he moved to Sumo. See our writeup on the GAS Charlie, with lots of photos alone and comparing its innards to those of the Sumo Charlie. Introduced in 1981 or 1982 by Sumo Electric Company (also known as All American Audio), the Charlie was the first complete tuner designed by engineer James Bongiorno. With a selling price of $499 it was not inexpensive but not outrageously expensive, either. Its origins are from Mr. Bongiorno's previous company GAS (Great American Sound). The Charlie has either a gold or black front panel with contrasting, heavy duty, black rack handles and push buttons. The black version has gold printing on the panel. No knobs of any kind are present. In the center is a multifunctional display with two horizontal rows of red LEDs for signal strength and multipath. A green LED is featured to signal stereo. The numerical displays are large 8-segment green LEDs. The numbers can be easily seen across a typical room. Starting from the left the buttons are: Power, Blend, Filter, Mono, Mute, IF Narrow, Tuning Down, Tuning Up, Store, Preset 1, 2, 3, 4, 5. The Mute isn't tied to the Mono button, some manufacturers practice that kind of "automation" -- never liked it. On the upper left off the panel is the Charlie notation and above the tuning display is the stylized SUMO logo. Rack mounting is possible. The black back panel is rather simple -- a connection for a 75-ohm antenna, 300-ohm antenna (tighten by finger), and a pair of fixed output L-R RCA jacks. To the right of the RCA jacks is a battery compartment for preserving preset station memories. (Batteries used: 2 x AA.) The polarized power cord is permanently attached. No fuses are seen -- built into the transformer perhaps? Construction is fairly light but strong. The front panel is 1/8" brushed aluminum. The rack handles are also of aluminum but are much thicker. The cabinet is of stamped steel and the U-shaped top cover is held on with four screws. The bottom has four plastic feet. The bottom of the circuit board is not accessible from a bottom opening -- the circuit board (or the bottom case) has to be removed. The Charlie weighs about eight pounds. The official model number is 700. Built by subcontractor Crown Radio in Japan, 5000 units were produced with the first 3500 having undergone James Bongiorno's final adjustments. The number of gold/black units seem to be identical. A couple of dozen units were made for Europe that have an additional digit. Space on the circuit board is seen for the additional components. The complete interior electrical design (including the transformer) was by James Bongiorno with cosmetic design by Adam Zareba. The antenna input as well as the 300-ohm balun are shielded, the signal then goes to the front end designed by Bongiorno and built by subcontractor Mitsumi. The schematic for the front end is not available but quick examination shows several shielded compartments and a 3sk74 which I believe to be the mixer. Next, a 3-pin ceramic IF filter (CF101) is encountered as well as an IF amp (HA1201 -- 8-pin IC, found no information on this device). The bandwidth of this filter is unknown -- need to research. I suspect that it is very wide. Next, are two 3-pin ceramic filters (CF102, CF103) which are followed by another HA1201 IF amp. Bandwith of these are unknown as well. These are followed by the "magic" and is part of the reason why the Charlie sounds so good and achieves great sonic specs comparable and even better than the Marantz 10B and Sequerra 1 in narrow mode. These are the phase linear IF filters (L107, L108, and L109). There are three groups of 6 cores each with a Q of 100. These are individually adjusted to achieve maximum frequency response and lowest distortion, for all signal strengths. Quite impressive. L109 is followed by the detector HA12412 which contains IF amps, Quadrature detctor, signal and center meter driver, etc. The device has very high S/N radio (88 dB) as well as low distortion (0.01%). There are adjustments to optimize phase for lowest distortion. This is followed by a what appears to be a filter stage of which I do not know the function (digital noise, perhaps?). Next is the stereo demodulator HA11223w (could find no documentation). The L & R outputs are next and these are separate NJM4580 op-amps having differential inputs and low noise, distortion, and great phase specs. High output current as well. Next in line are IC switches which may assist in muting during tuning and other functions as well as switching out the MPX filters. Following the switching ICs there are two rather impressive filter assemblies for final MPX filtering. Lastly there is a relay for output for each channel. The operation of the relay is silent. What is immediately evident in this tuner is that there are are a LOT of adjustments for all stages -- as many as 47 total. Internal wiring is at a minimum with most wiring being associated with connectors from the front panel to the main circuit board. There is a little wiring for the power supply and a pair of wires for the battery backup. Internal construction is fairly neat. Haven't seen all of the soldering so not much comment, though the back of the display board looks fairly good. The Charlie powers up quickly. The display is bright and very readable. The power supply transformer gets a bit warm. Sonically, in comparison with my other tuners (except for the 10B which is very close), it is virtually no contest: highs are better defined and more extended, the sound is incredibly clear, this attribute contributes to the Charlie's wider separation and more believable imaging. Bass is very tuneful. The narrow IF position works quite well, I hear no sonic trade-off between the wide and narrow. I always leave the narrow engaged. Comparing the narrow selectivity with my other tuners the Charlie holds its own. Not quite as narrow as the 10B and maybe the Yamaha T-2, but better than the typical tuner. It's on par with the Sansui TU-717 and SAE MKVI (narrow, adjacent and alternate), for example. The wide is quite wide -- it may help with a clear strong signal but I can discern no reason to use it. Sensitivity may be a bit less than the most sensitive of tuners: not quite as good as the 10B but slightly better than the T-2. Quieting sensitivity is superb. Stereo switching threshold is not adjustable like the 10B or internally like the SAE MKVI but the switchover point is reasonable. The Charlie seems to do OK as far as IP3 is concerned. Mixing products can be produced as happens in my location with every tuner I've used, but the Charlie has fewer and the remaining products are weaker. The "blend" function works well for weak stations. The separation is narrowed but so is the apparent noise. I can hear through the noise so the blend isn't used much, but it's nice to know it works well. The MPX filers can be switched out, if desired -- a nice touch. Since the Charlie does not have a tuning knob, it is not a typical "bandcruiser." Tuning by up/down pushbutton is in .1 MHz steps and is accurate. Still, tuning isn't too much of a chore. I use the five presets set to favorite stations on each 1/5 section of the band to help go from one end of the FM band to the other. Speeds up things a bit. (1) Tuning knob, (2) more memories, (3) signal strength METER, (4) a bit more sensitivity (still quite good though), (5) a bit more selectivity (still quite good though), (6) reduced IP3, and (7) scope outputs. 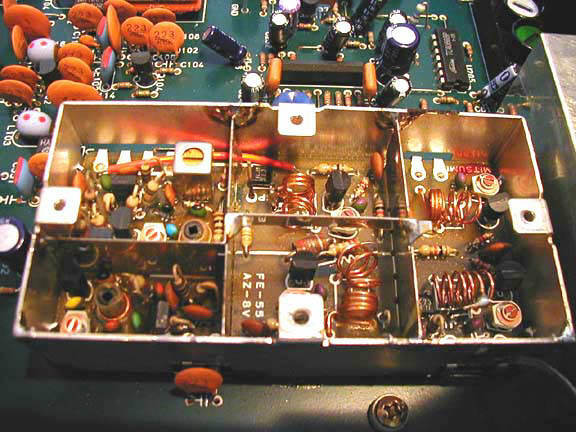 The Charlie and other tuners were plugged into a GAS Thaedra (another Bongiorno design) and a folded dipole (identically oriented) was attached to each tuner. Though fixed, the Charlie's output level was closely matched to the other tuners. Headphones used were GRADO SR-80. The front panel is simple, attractive, and the tuner is very easy to use. But when the Charlie is purchased, make no mistake, the money paid goes for the guts and electronic design -- right where it needs to be and it is spectacularly evident in this tuner. It bridges the gap between DX and audiophile. The Charlie is a keeper. This "tuna" tastes good. Many thanks to Stan Sexton and James Bongiorno for providing information and so many details. 1) In narrow mode, the Charlie's selectivity is not as good as the Kenwood KT-7500's, let alone Kenwood KT-1000, Onkyo 9090II, or Sansui TU-9900 or other famous super tuners. This is what I found in testing, and it corresponds with specs too. So this is a "borderline" super tuner as far as DXing, as described on the fmtunerinfo site. [Editor's Note: TIC never actually said anything nearly that flattering.] It might have better standing as an audiophile tuner, but if it is it has been a "sleeper." I wonder how informative the comparison with Marantz 10B selectivity really is. I do not believe the 10B specs of 150 dB alternate channel selectivity or 100 dB adjacent channel selectivity. The former would be impossible to measure, and the latter also isn't believable. Many people (I can give references) have described the 10B selectivity as mediocre (although it might be superior to some other Marantz models such as the 20). A good reference for state-of-the-art adjacent channel selectivity (the important spec for most people nowadays) might be McIntosh MR 78 or MR 80. The latter had a spec of 60 dB adjacent channel selectivity. 2) James Bongiorno chose not to make schematics or service information available to the public (or anyone besides himself, as far as I know). This arrogant attitude means that effectively no one can do anything on this tuner besides himself. It also prevents anyone else from "learning from" the design. This was similar to the kind of information (not) made publicly available for other GAS and SUMO products. I wonder about James Bongiorno being the greatest audio designer of all time (as his fans claim) for this reason if not others. His designs were not widely considered the ultimate either when they were introduced or today. The best that can be said is that they may have represented fairly good "value," but from my experience I can't say that applies if reliability is included in the calculation; I've seen two GAS amplifiers die under my supervision, and I can't say that for any other manufacturer. The GAS company itself died long ago too, after only a few years in business, and for some reason, James moved "through" a lot of companies (Dynaco, Marantz, SAE, GAS, and SUMO) without staying at any one for even a decade. All this would make you think it would be good to have schematics and service information be available to the public. 3) My Charlie makes a just-detectable (ear-to-tweeter) whistle on some stations where the Onkyo T-9090II is dead silent. Is this an SCA rejection issue? Actually, I like the way the Charlie sounds better than the Onkyo anyway, but there are others I might like even better than the Charlie. a) There is no front panel volume control, which IMO is more useful than muting. b) The 100 kHz tuning increment is pointless in the U.S. 200 kHz would be better. Beyond that, 10 kHz or 1 kHz would be better still (but not the Onkyo's pointless 25 kHz... that's more pain than it's worth). c) The front looks nice, but the identical buttons can cause some errors, such as pushing the "preset set" button when you mean to press a preset. You can't push the "preset set" button again to cancel, and you can't set *the same* preset as the one you are currently on either. Instead, I usually end up reprogramming some preset I didn't want to. There is some trick to get around this, but I can never remember what it is. d) The toggle buttons "feel" cheap, and the display looks kind of cheap, but they work fine, so this is not very important, as long as they keep working. On the plus side, I actually like the segmented signal strength display. Because the LED's can actually vary in brightness, they are more useful than you might at first think, and they have a nice log characteristic. Also, the multipath indication works very well and is very fast responding, and you can "lock" it in. Wow, this is one of the least sensitive expensive tuners I have ever tried. Most of the stations won't come in stereo - maybe it is misadjusted? It needs "narrow" to get stereo in many stations that usually came in fine on other tuners in wide. Sound is good on strong stations, but seems rolled off or bass bumped up. I'll measure it later. (From later measurements - it measured perfectly flat). It has a 6-gang front end, but 2 on the antenna side, which is unusual. The IF filter path is also somewhat unusual, with all those L cans- 18 total, which is very unusual, and expensive, but delivers phase linear filters, which is good. 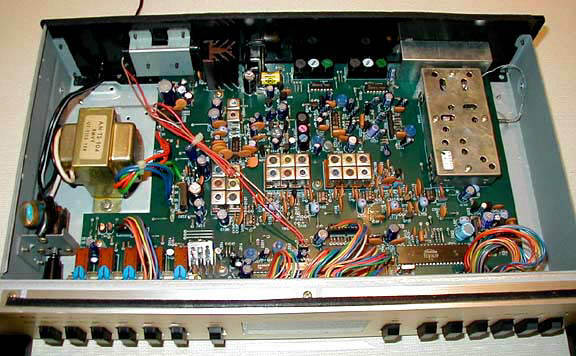 The power supply looks really wimpy, NOT audiophile, pretty typical or less than typical for an '80s digital tuner. The audio section uses the 11223 MPX chip, which is good. And there is a decent low pass filter on the output, also good. But nothing special in the the audio stage. 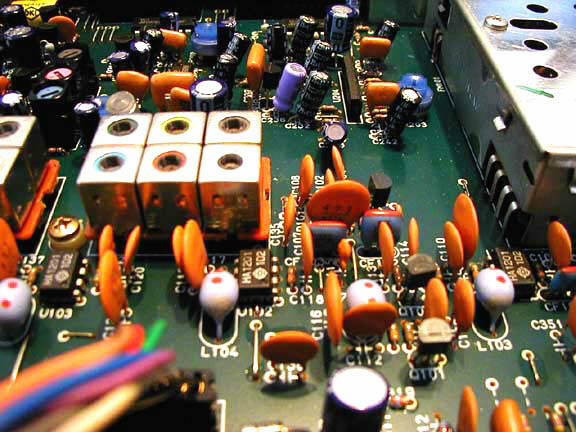 It has electrolytic caps everywhere in the audio section, typical of most mass production tuners. I'll listen some more. But as is, I would say it is totally unusable in my system due to the poor sensitivity. I think the Sansui TU-S7 and TU-S9 that go for $50 on eBay are built as good or better (they don't have the 18 filter cans, but do have linear phase ceramic filters and good selectivity). The Charlie's buttons feel chintzy, and the memory in line with the presets has me keep hitting it by mistake when going for preset 1. The use of the other buttons is kinda confusing, too - it's not obvious what red or green means. When you push in blend it goes green, but others go red. Is it on or off?? Since it does not have *any* audiophile parts inside, I think the decent sound is due to the 11223 MPX chip, the linear phase filters, and perhaps other tricks. I'll have to do a shootout between the TU-S9, which also uses that chip, and this one, sound and station-wise. But $500, No Way!!! And all the crap about not being able to mod it is real BS. All the audio mods that can be done to a KT-7500 could be done to this one. On the unusual 2 gangs directly after the antenna, you have to wonder why no one else does this. I think Bongiorno's approach may be OK for city use with many strong stations, but it kills the ultimate sensitivity for DX reception. I played with the Charlie. It just basically falls short on sensitivity. It appears that the narrow filter is off by 100-200 kHz, and I did not see any way to adjust it. Adjusting the oscillator did not do it. I had to move my signal generator off 100 kHz to get the signal centered (done with a scope at full modulation, looking at the audio output - the 400 Hz sine wave is "chopped" if not centered, especially at low signal levels). After adjustments, it still has poor sensitivity. I have a basement dipole that I use as really quick sensitivity test. It is pretty much a constant, so I can compare mono/stereo reception capability of different tuners. The Charlie is by far the worst solid state stereo unit ever evaluated there, for sensitivity. Some expensive tube units do better! The sound is good, but for all the ranting and raving the designer does about being an RF guru, best in the world, and so on, what gives? This tuner is then NOT for DX stuff, and can only be recommended for audiophiles with strong signals, say big transmitters 20-40 or so miles or less away, or ones with BIG rooftop antennas. Selectivity is horrible with Gaussian filters in both wide and narrow positions. Most of my well restored and aligned top-shelf Scott and Fisher tube tuners appear to beat the Charlie for stereo reception and sound. It is not a widespread conclusion that this is a top-shelf audiophile unit. The guys that are hyping it hard are very limited in number. It turned my ears at first, and I thought it had very good tone in the low and middle bass. And with a whopper signal, it was very quiet. But when doing detailed comparison to other units, the soundstage was NOT open, deep, and wide. It was flat and narrow. You can't hear the soundstage through headphones at all. So it has excellent low register tone, actually exceptional, and it can fool one. But it strikes out on soundstage. To me, the highs were funny - not harsh, but so mellow they were almost rolled-off sounding. Not expressive or resonant either, as a good tube tuner is. Add to this the sensitivity problem, and you can see why they sold for years for $200 used. The power supply is wimpy. I traced the output stage. The audio output sends the signal through 4 electrolytic caps, electronic switching, a JRC4560 op-amp (yuk), an IC switch chip, a serial relay, and a bunch of other crappy parts. Not exactly the recipe we know for good sound. I suppose you could get there easily, but I suspect everyone is afraid to touch it, out of fear of the wrath of the designer. It's ok, but does not sound as good as the Sumo Athena I had. Could be out of alignment, but I doubt it. Reception is pretty good, not great and since you can't "fine tune" I get a little pissed with it. It will be on eBay by Sunday. Not as good as the Magnum Dynalab FT-101, and you can buy a 101 for $300 or less if you pay attention. Clearly the 600T is in the category of things that simply could not be built today because it would cost too much, like the MR 78. Bongiorno says the same thing about his Charlie, but I don't see why, from a parts perspective, anyway. It looks like little more than a glorified transistor radio. I'll grant it may have a custom designed RF stage (even though it doesn't necessarily accomplish anything special) and a bunch (too many?) of hand-tuned inductors (and what does this accomplish, since it also has ceramic filters?). Here are some interior photos of the Charlie. 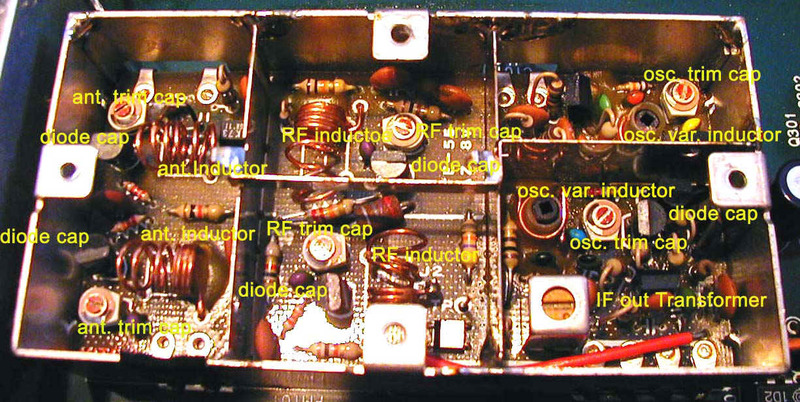 There are 6 gangs, two after the antenna, two in the RF amp section, and two in the oscillator/buffer. The gangs are usually identified in a digital tuner by the diode capacitors, trim caps, and inductors for each gang. The trim caps have a small flat slot on top for adjustment. The inductors are one of two types, and both are used in the Charlie. The coiled wire type inductor is used in the antenna and RF amp sections. This inductor is adjusted by bending the coil more open or more closed. The other type, as seen in the oscillator, is adjusted with a plastic hex tool by moving a slug into or out of a coil molded into a plastic assembly. 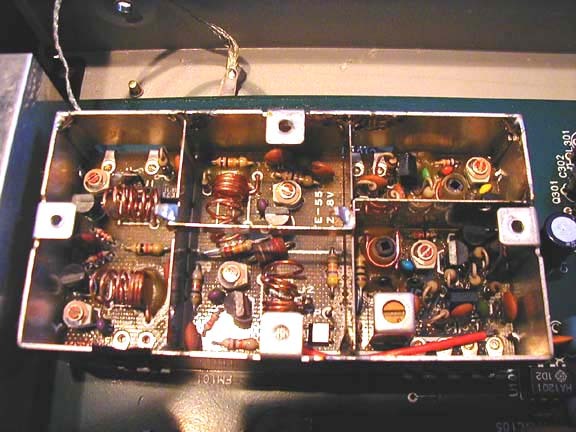 The output of the RF/mixer front end section shown here is done through the IF transformer. The signal at this point is 10.7 MHz. From this point it goes to the IF filter/limiter section. The "Files" section of the SAE Talk discussion group on Yahoo contains .pdf files of the Charlie Owner's Manual (Yahoo may require you to register for access) and we have the schematic. TIC also thanks Ampzilla Joe for providing a hard copy of the schematic.